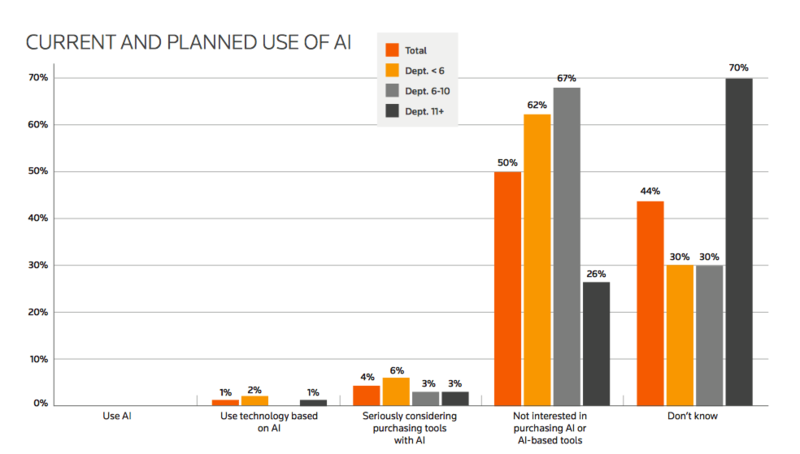 A new survey of inhouse legal team use of AI, by Thomson Reuters, has shown that – at least as far as the survey sample shows – GCs are woefully behind in the adoption curve compared to large commercial law firms, with just 1% of inhouse lawyers saying they use any type of system with an AI element in it. The survey of 207 inhouse lawyers, from senior GC roles to more junior staff, also suggests a strange dichotomy, where many respondents said they were generally ‘ready’ to make use of any technology that was available, but very few were actually doing so in relation to AI. For example, only 1% of inhouse lawyers (see table below) said they were using ‘tech based on AI’. While none said they were using an AI system. (That said, the survey was a bit confusing as it was not clear what Thomson Reuters means by ‘AI systems’ as opposed to ‘technology based on AI’.) And, while 4% said they were ‘seriously considering’ purchasing AI tools, 50% were explicitly ‘not interested’, while 44% were so uninformed about legal AI that they simply couldn’t answer the question. 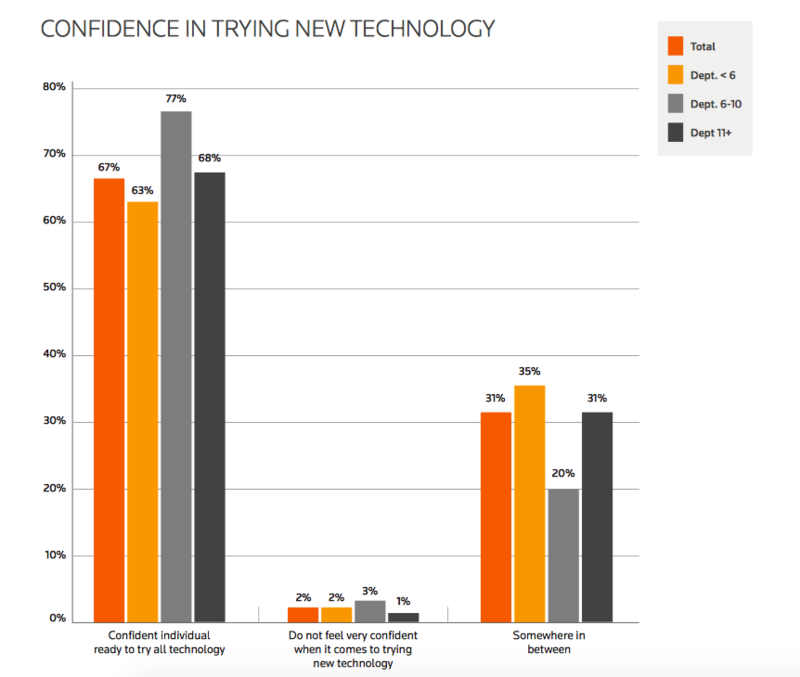 Yet, as noted, 67% said they were ‘confident’ and ‘ready’ to try any and all new legal tech that was thrown at them. While this seems like a paradox this mirrors what many inhouse lawyers have told Artificial Lawyer. For example, one global financial services company has said they very much wanted to use AI systems, e.g. for doc review, but they neither had the internal know-how to get such a project started in the legal team, while anything that connected to the company’s overall data and document management system had to go through central procurement. In the case of the global financial services company, they gave the example of how they’d tried to bring in a new piece of legal tech just for the inhouse team, but as expected it had to go to central procurement. Then the company wondered if the legal tech system – because it connected to document management – could be used globally across all departments. The decision took months and months. Eventually, someone in the C-suite said no, and the whole project was dropped. Add to the fact that not every inhouse team has staff with a focus on legal operations and one can see why GCs are both ready for AI, but doing little about it, or simply don’t really know what can be done. 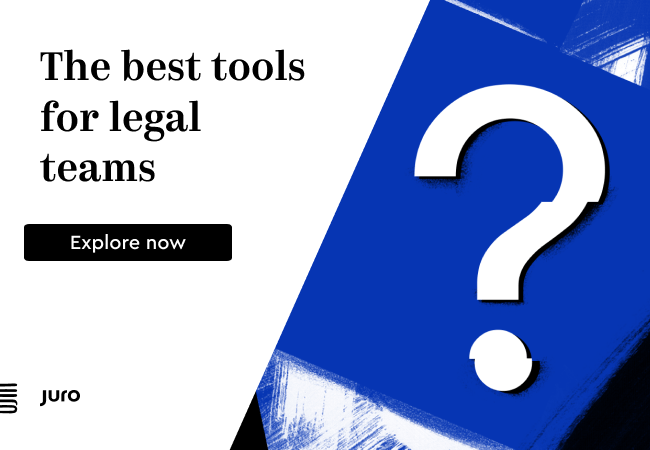 This is a major difference compared to law firms, where, for example in the UK nearly all the Top 30 law firms by revenue are either using or piloting some form of AI system, according to Artificial Lawyer research with The Times. Moreover, several legal AI companies have in fact been very successful selling their doc analysis systems into large corporates. Seal Software, for example, can list many of the largest companies in the world as clients for its AI tech. That said, in some cases the main user is the procurement, compliance or sales teams. Clients include: Experian, DocuSign, Parker Hannifin, DropBox and Merck, to name just a few. Other companies such as the UK’s BT has also been making great use of AI for doc review, but….not necessarily via the inhouse legal team. As seen below, inhouse teams felt confident. Yet, the vast majority of those sampled are either not interested or do not know anything about legal AI systems. And, only a tiny number were using. I.e. if the sample was 207 inhouse lawyers, then the 1% use figure equates to just two people, in presumably two companies. And yet, perhaps frustratingly, the inhouse lawyers all predict that AI adoption will come soon. This reflects a picture of inhouse lawyers who don’t really know a great deal about legal AI systems, e.g. that they predict it will have an impact in 10 years, when many of their advisers are already using or trialling AI systems. And yet, as noted above, many large companies are using ‘legal AI’ systems already but sometimes without the GC having any direct role in their use, as it’s the compliance or procurement teams working with them. Also, LPOs and ALSPs are using AI systems now. It seems that GCs are almost the ‘last to know’ here. This has to change. 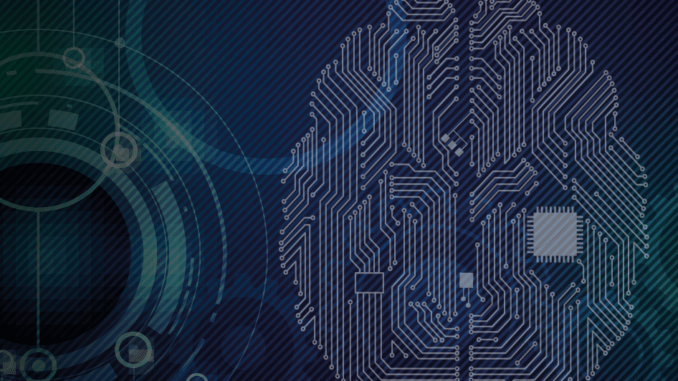 Fundamentally it shows that there has never been a greater need for inhouse legal teams to increase their level of knowledge about AI systems, their uses, their benefits and how they can be implemented. Only once they are informed can they make decisions about implementation. That said, it’s not as if AI tech companies, law firms, LPOs and just about everyone else in the legal market isn’t more than happy to talk to GCs about AI. If you’d like to download the slightly frustrating report, please see here.